All too often, “bike enthusiasts” get caught up thinking “bigger is better”, whipping out rulers to measure their… Uh, displacement. But this argument doesn’t take into account the simple pleasures of a bike happily whizzing along the open road. It’s easy to forget that all of the major manufacturers cut their teeth on small, affordable, economical machines. Many of these little bikes have the same race-winning DNA as their larger siblings and are extremely fun to ride and own. 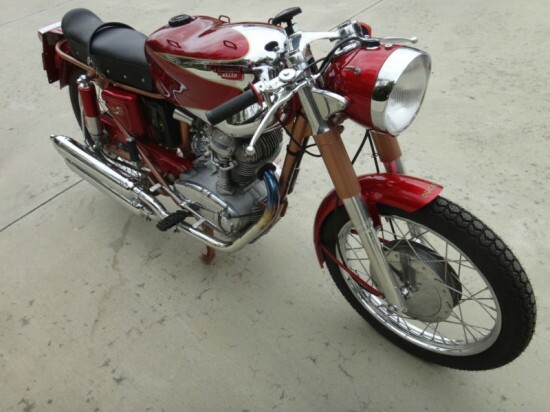 The Ducati Elite was introduced in 1958, and the 204cc machine was very popular at the time: light, sporty, fun to ride, and very frugal. The little 204cc bevel-drive single put out 18hp through its four-speed box and could push the machine to almost 90mph. What is original on the bike as I got it? – Frame, toolboxes, engine/gbox. 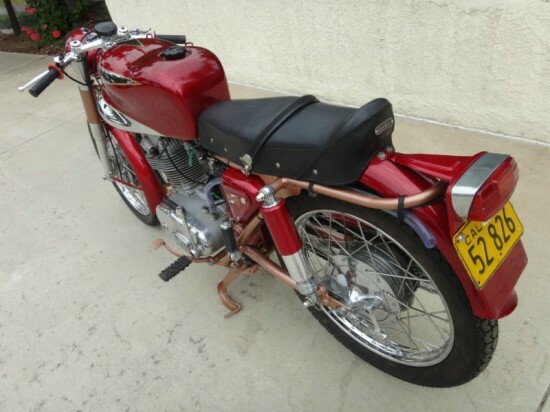 Hubs, spindles, chain guard, rear number plate, exhaust pipe, forks, it is a 1959 as the serial number on the engine is 150691 which is consistent with that year and the cylinder head has the fins on top versus after 1959 they did not. What are original Ducati parts I located? 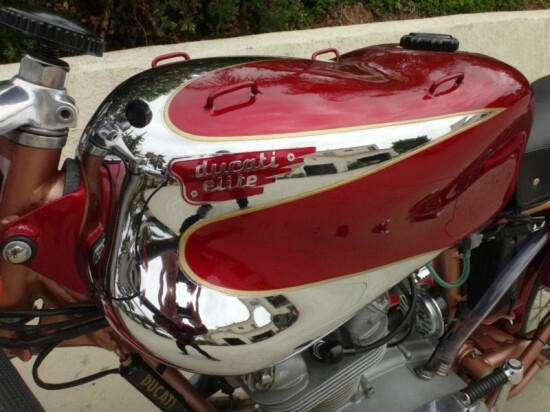 – Gas tank (not a copy and sealed with Caswell sealer) Headlamp shell, front fender. fork aluminum covers/headlight bracket, rear shocks which are regular not all aluminum which some bikes had in 59. What is new? 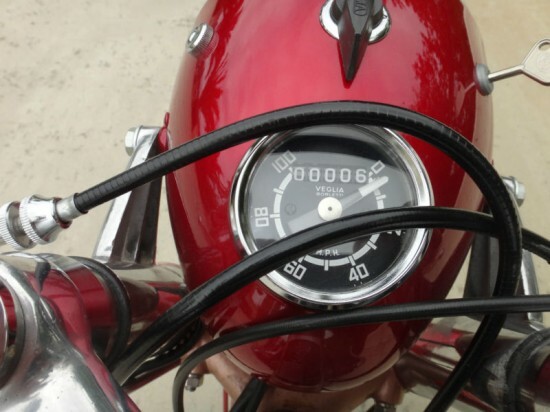 – Italian rims, SS spokes, tires (‘RADO” Chinese I think, sorry) Generator and regulator ( from the UK an upgraded set which can be converted to 12v )Rear Fender, clip ons, Speedometer, seat, Silencers, horn, cables ,switches and wiring, battery. Seat, silencers, clip ons and some other parts were from Italy. All rubber parts. Paint – Frame powder coated, all rest painted. As for the frame color I have had various comments when I have showed the bike at events that “ is it the right color?” I have seen many pics of other bikes and some it looks like and some it is slightly off. I have another frame with some original paint and I think it is very close but then that paint is 50 years old. The tank, fenders and toolbox paint is excellent and was matched with original paint on the toolboxes. All paint is in excellent condition. Chrome is new and excellent. General – The engine, gearbox and clutch was rebuilt with all new bearings and piston rings. I intended to rebore as cylinder had some wear but in my opinion not bad enough to bore but I have a new OS piston and rings that are included in the sale if whoever buys wishes to do. The engine starts and the bike runs and shifts properly. All electrics work. I have done 7 miles around the block on it since rebuild, The engine cases and engine aluminum parts were vapor honed which without doubt is the finish of choice for restorers. New brake shoes and chain. I have used original Ducati fasteners where possible. These are beautiful little machines: take a look at the “jelly mould” tank and the striking paint. I’d want one in my fantasy garage for sure. Bidding’s already north of $10,000 and the reserve has not been met. Given the apparent quality of the restoration, I’m curious to see what sort of price this Ducati will command when the dust settles. Davida, Armani, Ray-Bans, I’m on my way to get an Espresso, to bring back to my Mid-century Modern apartment (preferably, in Rome). I wonder what my wife will have to say about all this.